Starting to feel Christmas-ish at the Villa Maylandia! Hello friends! I’ve made a start on decorating our home for Christmas! I have another finish to share but I have misplaced it for the moment! It’s Shepherd’s Bush’s Cotswold Sampler – I’ll show you soon when I figure out what I have done with it! In other stitching news I’ll be joining Vonna and the rest of her mad crew stitching on the Prairie Schooler Alphabet (probably a new year start)- I’m really looking forward to some PS stitching! I am still plugging away at the purple spot sampler and now have more than half of it done! I’ll have to share a photo of my progress soon! Till next time my dears, happy stitching. Wonderful decorating! 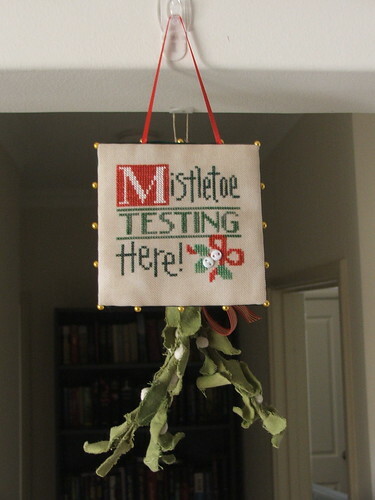 I love mistletoe!! Love your two pieces! Interesting about the mistletoe. Glad you’ll be joining the PS ABC SAL. It’s such a fun piece for me so far! It’s starting to finally feel like Christmas around here too. Snow fell yesterday so it’s perfect for our trek out to the Christmas tree farms today — all snowy! 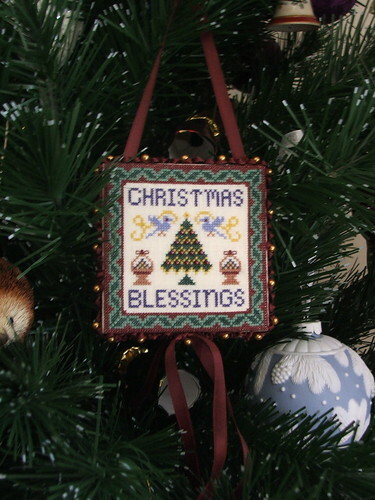 Your stitched ornaments are lovely. Enjoy your mistletoe! Your ornaments look wonderful! And glad to hear that you’re joining the PS SAL with the rest of us crazies. I just started today and so far so good! Love the LK design and great mistletoe. We do have an Australian native mistletoe, but it just isn’t as nice as the real thing. Make sure you make good use of the mistletoe,lol! Lovely decoration! Glad you found the perfect (and reusable!) mistletoe. Love the LK design. Looking forward to seeing your progress in the PS SAL.